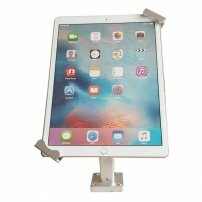 Universal On-Wall Mount / Desktop Stand with Secure Lock (Arc Arm) for iPad Pro, iPad Air, Tablets : allputer.com - Accessories for all your Portable Electronics & Computers! - With secure lock, suitable for using as a Demo Stand for public display. - 90 degree adjustable (left-right, up-down), adjustable viewing angle, shift from landscape to portrait freely in a second. - +30 degree / -30 degree (total 60 degree) adjustable viewing angle, shift from landscape to portrait freely in a second. - Built-in secure lock, suitable for public display and not easy to fall over. - No cables will be included you may contact us if you need a cable to get your iPad / Tablet Charged for this stand, you may purchase in the cable categories.